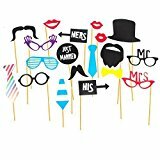 Stylish & Fashionable Just Married Glasses Selfie Prop Kit For Parties! Pre Assembled 20pcs. Check out our brand new stylish pre assembled Photo Prop Kits! Set contains 20 fun and unique props on wooden sticks. Make your event photos extra memorable with a fun photobooth. Sticks measure approx 20cm but overall measurements varies on design. Designs sent at random.